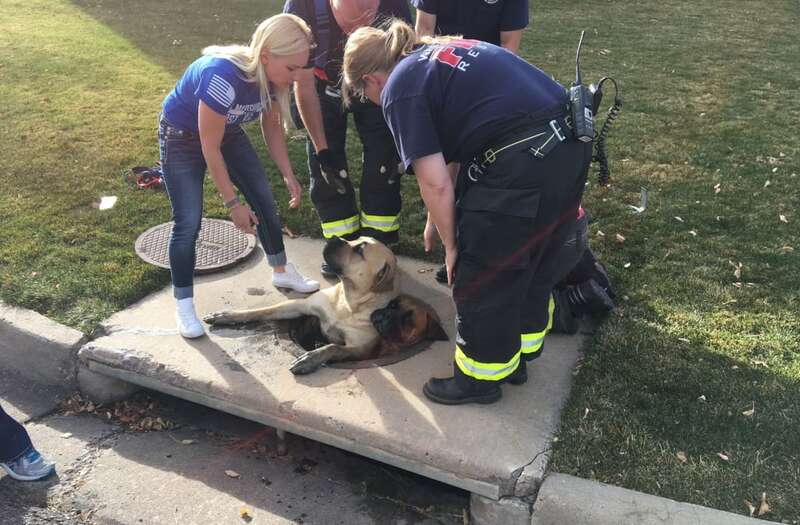 JEFFERSON COUNTY, Colorado (KDVR) -- Three mastiffs were rescued after getting stuck in a storm drain on Monday, the Jefferson County Sheriff's Office said Thursday. The dogs escaped their yard near South Zinnia Court and West Arlington Place and ran into a culvert, the sheriff's office said. “Dogs are funny and curious creatures who love exploring, especially when they’ve escaped their yard," the sheriff's office wrote on its Facebook page. JCSO Animal Control Officer C. Hubrecht received a call Monday about not one, not two, but THREE mastiffs stuck in a storm drain at W. Arlington Place and S. Zinnia Court. Sure enough, there they were. But how? Well, dogs are funny and curious creatures who love exploring, especially when they’ve escaped their yard. At least this furry group brought their friends along when they ran into a culvert nearby. "At least this furry group brought their friends along when they ran into a culvert nearby." Firefighters from West Metro Fire Rescue were able to get the dogs out. "Whether you have four legs or two, we'll be here if you need us," the sheriff's office said. The kids and their mom who own the trio say they're great fun and "just mischievous." The dogs are two brothers and a sister, and the smallest one, the sister, is the ringleader. She likes to lead her brothers on adventures outside of the yard. The family said they've fixed the backyard so the their three pets can't escape again.